It may seem like a strange thing to say, but a whole house heat pump can work efficiently all year round. Many people are unaware that their heat pump is, in fact, a heating and a cooling system in a single unit. This is a significant departure from the more traditional method of using an air conditioner and a separate forced air heating system. Let’s take a closer look at how this works and why it may be a good choice for you. The process of cooling your home uses refrigeration to displace heat. Refrigeration cannot create cooling; it can only move heat from one place to another and indirectly create a cooling effect. The refrigerant cycles through the internal coil into the compressor and then the indoor coil continuously. When it is subjected to the correct temperature and pressure levels the refrigerant can absorb the heat in your home and transfer it outside. During this process, the refrigerant is a liquid that then evaporates into a gas to absorb the heat and it then it condenses back into a liquid as the heat is released. A traditional heating system uses some kind of combustion or electrical resistance to generate heat in your home. However, as we have already seen, a refrigeration system is a closed system that is cyclical in nature. It is possible with the correct heat pump to use the same process used for cooling in reverse. This will cause the refrigerant to flow in the opposite direction, displacing cooled air and depositing heat into the home. There are significant financial reasons for choosing ducted gas heating systems with a reverse valve. Using electricity to generate heat is an inefficient method for heating your home. Moving heat using a heat pump instead uses approximately 50% less electricity and significantly lowers energy bills. Additionally, when used for cooling a heat pump system has an efficiency rating equivalent to the best central air conditioners on the market. If you currently have no ductwork in your home, you could still benefit from installing a whole house heat pump. There are ductless mini split heat pump systems that can be installed without any venting. They are mounted high on the wall to blow air into the room, and they connect to an outdoor unit using a refrigerant line that is run through a small hole in the wall. Ask a local air conditioning professional for more information if you’re considering this option. 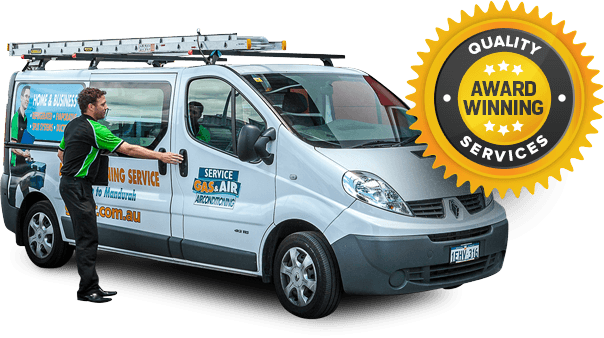 If they are interested inducted gas heating, Perth residents should contact us here at Gas & Air We have extensive experience in dealing with all kinds of domestic and commercial heating and cooling systems. We would be happy to advise you on the most efficient option that will suit all of your heating and cooling requirements.